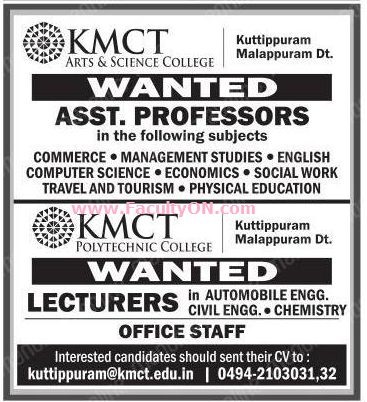 KMCT Arts and Science College, Malappuram has advertised in the MALAYALA MANORAMA newspaper for recruitment of Assistant Professor jobs vacancies. Interested and eligible job aspirants are requested to apply immediately from 09th May 2018. Check out further more details below. About College: The KMCT Arts & Science College at Kuttipuram was established in 2013. The College is recognized by the Govt. of Kerala and affiliated to the University of Calicut.